When? Thursday, September 6 – Sunday, September 9 (3 nights). An extra day would have been nice since we spent so much of our time relaxing. However, had we not done that, I think three days (actually two and a half) would have been plenty to see the sites we really wanted to visit. Where? We stayed at the W Barcelona, which was right on the beach, way out past the Barceloneta area. The rooms were gorgeous, the staff was friendly, it was very luxurious and had several bars and restaurants. Oh, and it has a pool and direct access to the beach, with a private section for hotel guests only. We used our starpoints for the entire stay – 20k per night for a total of 60k. For the room we stayed in, it probably would have been around 300 euros/night. The real downside is the location, and then also cost if you don’t have starpoints to use for a free stay. If we were to stay in a Starwood hotel the next time we go to Barcelona, we would probably try Le Méridien since it’s less starpoints per night and located right on La Rambla. However, the Gothic neighborhood was really our favorite, so I would be more likely to find a hotel there. Transportation. We flew into the Barcelona airport and took a taxi to the hotel (which was not very close). There were tons of taxis everywhere, which we took advantage of since our hotel was so far away from everything. The metro, like all others we’ve rode in Europe, was efficient, smooth, and easy to use. We took the high speed train to Sevilla after our three nights in Barcelona. My advice: get to the train station early! It was super crowded and it looked more like an airport with check-in lines, security lines, and several boards with departing and arriving trains. It was a bit confusing, but luckily we were there about 25-30 minutes before our train was set to depart. Food. In Barcelona we were first introduced to tapas – it was good, but not great. We did try several amazing tapas our first night in Barcelona (we ate with some friends from California who happened to share just this one night in the same city as us). Another great find was a pintxos bar, which I’ll explain in more detail in a future post. Day Trips. No day trips and none were considered. Attractions. There is a lot to see in Barcelona. 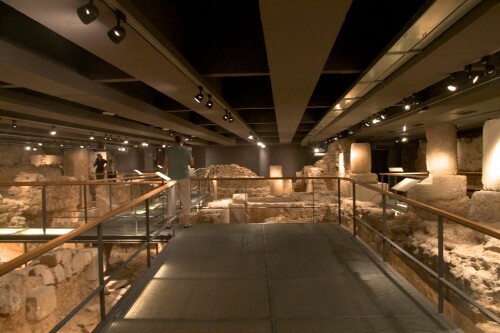 We loved seeing the Roman ruins from 2000 years ago in the City History Museum (pictured right) and thought that Gaudi’s Sagrada Familia was breathtaking. I would highly recommend both of these sites! We decided not to visit Gaudi’s Casa Milà and Casa Batlló (both were expensive and we were wanting to relax) and also skipped Parc Güell since it was so far away. We did, however, decide to stop and see the Picasso Museum, which was interesting, but did not have much of Picasso’s cubism paintings. I thought that the most interesting paintings were Picasso’s interpretation paintings of Velázquez’s Las Meninas. Language Barrier. Catalan first, Spanish second, English third. That being said, almost everyone we encountered spoke English. Even if I initiated a conversation in Spanish, the response was in English. We were also always given English-only menus at the restaurants. It was frustrating because both of us took Spanish in high school and some in college, and then I spent some time before our trip brushing up. However, my (Latin American) Spanish is no where close to fluent, and it seemed like it was all or nothing in Barcelona. As soon as there was a confused face or an English word spoken, the remainder of the interaction was in English. Cost. The food could be expensive, especially right around touristy La Rambla. Finding hidden tapas bars off of the main area is your best bet for cheaper tapas. We also felt that the sites were generally a bit more than we wanted to spend (for example, the two Gaudi sites that we skipped, and the Sagrada Familia – all around 15-20 euros). Advice. Stay in a more central location than we did, unless you are looking to experience a relaxing, beach vacation. We loved wondering around the Gothic neighborhood – it was beautiful and tucked away from the crowded and touristy La Rambla (not that there weren’t tourists everywhere in Barcelona). Our friends stayed in this area and loved it. Closing comments. While we enjoyed Barcelona, it was our least favorite stop on the trip. I think this is mostly because we didn’t enjoy the food as much as we were expecting and we didn’t feel a real connection to the city or its people. It was more like Rome – a big city with a lot of personality, but also a but overwhelming at times. 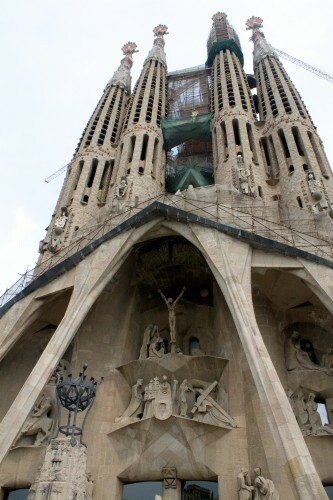 This entry was posted in City Overview, Travel and tagged Barcelona, Portugal/Spain 2012 Trip, Spain by Kristin. Bookmark the permalink.